At the Fitzgerald Theater in St. Paul, home of Garrison Keillor’s “A Prairie Home Companion,” the stage looks like a warehouse full of miscellaneous equipment. A drab brown curtain hangs toward the back. Pat Metheny, carrying a guitar, wearing a long-sleeved black T-shirt, black pants, and sneakers, his hair a fuzzy nimbus, walks out and mouths “Hello” and “Thanks for coming.” He plays something lush and chordy. A roadie runs out with guitar number 2 and Metheny gives us another beautiful tune, making six strings sound like sixty. Back comes the roadie, this time with the Pikasso, the Hummer-sized hybrid with four necks and 42 strings. The main neck seems to function like a Chapman stick; Metheny touches the strings but doesn’t pluck them. The sound is exquisite, room-filling. The roadie returns with guitar number 4, an Ibanez hollowbody. As Metheny plays, small cymbals on a table to his right start to ring. Behind him, a stick lays a simple rhythm on a hi-hat. Lights spark on each instrument when it sounds. Metheny plays guitar over what becomes a rather monotonous, mechanical-sounding beat. Then the curtain lifts and the audience gasps. (Others have written about this. It’s true.) 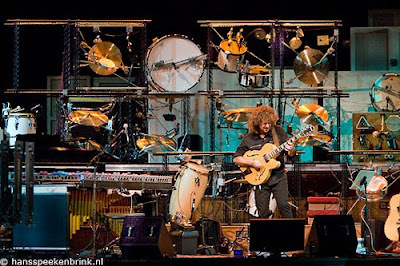 Behind Metheny is a wall of racks supporting dozens of percussion instruments and metal arms that will be used to strike, brush, or shake them. This photograph from a concert in Amsterdam shows a slightly different arrangement than the one at the Fitz but close enough to give you a good idea. The finger cymbals and hi-hat were a tease. Now Metheny plays and the wall lights up and moves. Along with the percussion instruments, his mechanical array includes two Yamaha Diskclaviers, marimba, vibraphone, bells, basses, guitarbots, and cabinets filled with dozens of tuned bottles. It’s an antic hardware store, a mad inventor’s lair, Disney’s Fantasia or an Animusic film. (Guitarist Paul Metsa, who’s sitting behind us, would later write on Facebook: “Like sprung from Terry Gilliam’s head.”) Metheny stands in the midst of it, controlling it all with his fingers and feet. This is a solo performance, a one-man band to the nth degree. He comes to the end of the tune, then exits stage left to where a monitor glows. Returning, he asks if we’d like to hear it again. He explains that he forgot to say “next” at a particular time, and he thought his solo could have been better. As we hear the next several selections from the “Orchestrion Suite,” I wonder how much of the performance is programmed and how much is real-time, in-the-moment music. Is this composition and improvisation or gimmickry? I think of the Guggenheim Bilbao, a museum I visited a few years back. The building itself is so spectacular that I’ve forgotten the art I saw inside. Is Orchestrion an edifice? Is the architecture the point? Colorful moving images glide across the drumheads and cabinet fronts. They look like animations, then resolve into forms—mallets hitting surfaces, bells shaking, Metheny’s hands, Metheny’s hair. Apparently the construct also includes cameras. I like what I’m seeing and hearing—it’s enormously entertaining—but I wonder if I’m supposed to like it. Who's on stage, a great guitarist or Oz the Great and Terrible? The tireless roadie brings out guitar number 5. 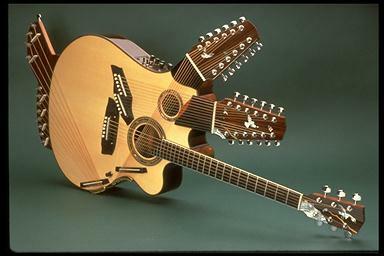 It has two sets of strings: one running lengthwise down the body, the other reaching from side to side. As Metheny plays a solo, little mechanical fingers inside the guitar pluck the strings from behind. (If you go to this show, bring binoculars.) It's a little creepy. Metheny tells us more about the Orchestrion project—how his wife thought he was crazy, and how each performance requires doing a million things on stage, most of which we never see. He demonstrates making loops and layers until every instrument on stage is sounding and he goes to guitar number 6 (brought out by the roadie and placed on a stand at playing height), swings guitar number 5 around to his back, and wails. I wonder why Metheny didn’t use samples and synths instead of creating his complex mechanical orchestra (which must be a nightmare to move from place to place; how did he get it to Europe and back?). He has said in at least one interview that he wanted sounds that are alive, the sonority of notes mixing in the air, not in a speaker. The drums and cymbals heard on the recording (not sure about the live shows) belong to Jack DeJohnette, and the mallets that play the marimba and vibes are Gary Burton’s. One thing Metheny doesn’t say is “I’m Pat Metheny and I can do what I want.” After 35 years of recording and performing, 17 Grammys, countless bests, and thousands of live performances, he has earned the right to do something he has always longed to try, as strange as it may seem. Whether we like the results or not, we have to give him that. Near the end, Metheny plays something slow and lovely, full of bells and bottles, like a muted calliope. Then something lively accompanied by his mechanical orchestra. His joy at playing with his big toy band is contagious. He returns for two encores. I look at my watch for the first time all evening. It’s 10:30. He’s been playing for almost three hours with no intermission. He leaves to a standing ovation, the house lights come up, and workers swarm the stage to start the teardown. The show goes on again in Chicago in fewer than 24 hours. Some live performances are unforgettable, not always for the right reasons. I don’t think we heard Metheny play the best he’s ever played (how could he, with all those distractions? ), or that his “Orchestrion Suite” is the best music he’s ever written, or that the Orchestrion was the best idea he’s ever had or will have. But I don’t care. For three hours, I was glued to a maroon velvet seat, fascinated by what I was seeing and hearing, by the scale of Metheny's idea and the incomprehensibility of its execution, the audacity of his vision, the generosity of his label (Nonesuch), the willingness of the sold-out (or nearly sold-out) crowd to come out and hear him (many bought their tickets through Metheny’s fan site the day they went on sale), and the uniqueness of the experience. I know I’ll never repeat it. Once is enough, and what’s wrong with that? In retrospect, I did too much wondering. If you’re reading this and Metheny is coming your way, just go. Gasp when the curtain rises and the Orchestrion is revealed in all its wacky glory. Step into the rollercoaster car, lower the bar, hold on and enjoy. Much more on Orchestrion here, including a short film. A piece of a pro-Orchestrion article from JazzTimes. StarTribune critic Jon Bream disses the show. Had I known I would be sitting before a one-man-band with all sorts of metal contraptions and distractions surrounding him, I would never have purchased these front row tickets. When I entered the Town Hall this Saturday evening I thought I was in for the musical performance of my life with not just Pat Metheny but his band of real players (people, not computer generated movement of musical instruments). It was such a disappointment. Sorry Pat, but the clanging and banging just didn't keep me glued to my seat so with a nod to my girlfriend we got up and walked out. Next time please bring the band. The show sounds great! Well written description, Pamela. I remember seeing Metheny with Lyle Mays at the Orpheum way back when, when the Off Ramp album had just come out, and being amazed that they could make the same "studio" sounds on stage. I guess the magic continues (though I haven't listened to a Metheny album in years). Donald, you're not the only one who didn't enjoy this concert. One of my best friends found it boring and left early. Knowing what to expect definitely helped. Thinking you're about to see a PMT performance and getting Orchestrion must have been a surprise--in your case, not a good one. I enjoyed it because it was so unusual. For me it was not as much about the music as it was about the vision and daring (and craziness?) of the whole idea. I'm glad I saw it. John, thanks for writing; always good to hear from you. I last saw Metheny at Orchestra Hall in 2007, with Christian McBride and Antonio Sanchez. Some people didn't like that show, either--they thought it was too rock-and-roll. I'd never left so much as a two-dollar matinee at the movie theater early. My wife and I tried--we really tried--to care, but just couldn't. We left East Lansing, MI before Pat uttered a word. We heard him addressing the half-empty auditorium as the doors closed behind us after 65 minutes of music. That, from fans since 1974. As we walked back to the car, I remarked that te concert should have been billed, "Ode to Self". “I’m Pat Metheny and I can do what I want.” summed it up well. We OWE him that? BS! At $65 a ticket and up, who owes whom? Bring Lyle, and any drummer, bass player and percussionist you want, and I'll listen all night. You said it, donald.